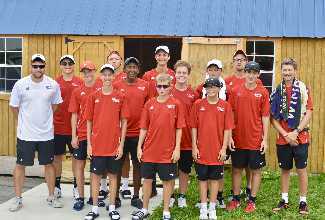 The Munster Boys Tennis team is looking forward to a great season. Both Head Coach Patrick Spohr and the new Assistant Coach, Eric Mackowiak, are excited about this team. "We only lost one varsity player from last year so we have some very experienced players right now," stated Coach Spohr. "And we have 10 freshman joining our program. That's really encouraging for the sport and the future of Munster Tennis." As in the past, the team has a motto printed on the back of their shirts. This year, it's "One Goal." The goal is to make it to state. With the first polls out, Munster is ranked #12 in the state. The Coaches have planned a lot of trips to the Indy area for more competitive play hoping that will get their team ready for a state run. "We take one game at a time," said Coach Spohr. "We learn from every experience and make adjustments along the way." We met Fort Wayne Leo and Fort Wayne Carroll at the Plymouth Crossroads Invitational on Saturday August 18. The Varsity lost 2-3 to Leo, with a squeaker match at 3 singles. 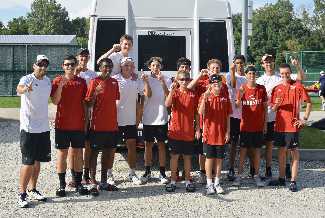 We then played Carroll and won 4-1, losing only at 1 Singles. Our JV players won all of their matches today. It was a perfect day for tennis - partly cloudy, warm and very little wind. A big thanks to all of our fans that came out to support us! Between the Munster girls tennis players, the ankle-biters from Briar Ridge, and many of the past tennis families, the cheers were loud and clear! We beat the #2 ranked team in the area 4-1, losing only at 1S. The JV won 9-3 so overall it was a strong showing. Valpo had some hard servers which gave us a good chance to work on our serve receive. Up next, a conference match vs Lowell tomorrow. Go Stangs! It was a beautiful day for tennis! We brought 14 players to Culver and lots of fans. We played Culver, Penn and West Lafayette - all teams ranked in the top 30 in state. Every match ended up 3-2 with wins at 1D, 2D, and 3S. Our 2S Peyton Specht had two very long tough matches and was last off the court at the end of the day. He left it all on the court and should be proud of the effort. 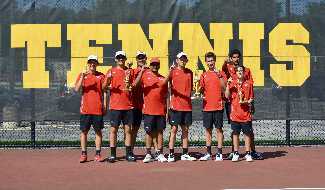 Joe Webster at 3S battled to help us win the Penn match in a tiebreaker. It was a high pressure match with both teams watching the court but Joe pulled out a win. On the JV side, we had a very strong showing with only a few matches dropped. Two of our JV singles players, Charlie Morton and Nick Stephan, went undefeated. We have a team deep in talent and we were happy that so many of our players proved themselves at Culver. Rain has been our biggest opponent this season. Once again, we traveled to a tennis tournament wondering about the weather. Coach Spohr got us to the courts early and started play immediately in hopes of getting the full tournament completed. We entered two teams in this invite. Our top 7 JV players got their first taste of a varsity-level tournament. All players completed their first match and some a second before the rain hit. We are happy to report our doubles teams are still both undefeated for the season. 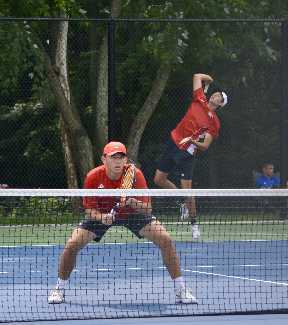 Frank Wolf and Zack Schmidt (1Dubs) met #7 ranked Fishers in round 2. They battled with a 6-1, 4-6, and 12-10 win (10 point tiebreaker) to keep their streak going. DJ Fesko and Kathir Venkat have had some close matches at 2Dubs but continue to win with their great chemistry on the court. Although we didn't finish the tournament, the experience was great and the coaches found some more things to work on as we gear up for the state run. Munster Breaks the top 10! Munster is ranked #9 in the Indiana Coaches Poll for the week of September 9, 2018. Way to go Stangs! It's been six years since the Mustangs participated in a JV tournament but Coach Spohr felt this group needed the competition. With Coach Mack at the helm, the team of 1 senior, 1 junior, 1 sophomore and 4 freshman came out on top. Charlie Morton, 1 Singles, started off the day with a quick win. Ryan Muntean at 3 Singles had a tough opponent in South Bend St Joe but came up with a victory. Both doubles teams had no problem winning their first round. 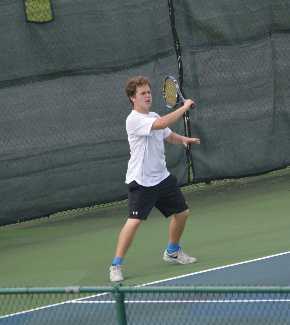 Nick Stephan at 2 Singles battled Penn but came up short. With 4 of the five teams winning the first round, we knew we had a good chance to get the points to win the tournament. Round 2 brought wins again for all but 2 Doubles Ronav Panigrahi and Shreyas Iyer. South Bend St Joe's net play threw them off their game. Round 3 gave Charlie Morton and Ryan Muntean their third win and first place in their divisions. 2 Singles and 2 Doubles also won their last matches placing them 5th and 3rd respectively. 1 Doubles team Max Ladd and Louie Wolf were down 4-1 in their finals match against a much-improved Penn duo. Munster had beaten them at Culver but struggled against them today. Max Ladd's explosive serve changed the momentum to gain two games. Ladd and Wolf went down 8-5 but they definitely gave it their all. At the end of the day, Munster won the tournament with Penn at a close second. Coach Mack said, "I am so proud of these young men. They really played hard and supported their teammates. It was a great day. The best!." It was a busy night at the MHS Courts. 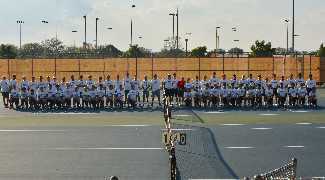 First, we had a scheduled match vs Chesterton in which both teams dedicated their matches to someone affected by cancer. "Smash Cancer" is a national program used by tennis teams to raise funds for cancer research. Peyton Specht, new co-captain, organized the t-shirts worn by all the players with a list of who they honored on the back. It was very emotional to listen to each player and coach call out a name or two as they stepped forward. 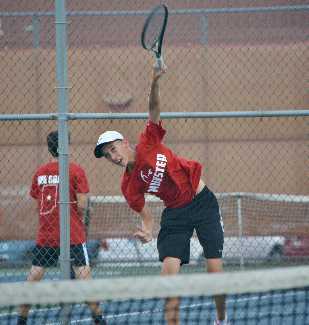 When we did finally hit the courts, Munster came out on top with a 4-1 win over Chesterton. And last, it was our night to recognize seniors Shreyas Iyer, Zack Schmidt, and Frank Wolf. We had a cookout, cake, and decorated the courts with banners and signs. Each senior was recognized by the coaching staff, given a blanket and flowers for their moms. It was a great celebration for a great group of young men. 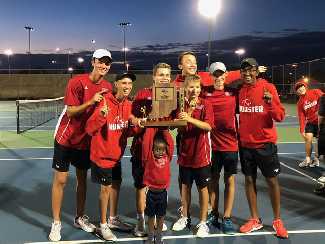 Munster hosted the sectionals for our area on September 26 and 27. We drew a bye for round 1 and then met Calumet in the semis. We won 5-0 with a tough match at 1 Singles. Then we faced Highland for the finals and came up with another 5-0 to clinch the sectional title for the 38 consecutive year! Congratulations Coach Spohr, Coach Mack, and Coach Rothstein for another great performance. On to regionals next week which will again be hosted at Munster.